Hi everyone, we’re switching over to a weekly format as of today! Each Monday I’ll be posting a list of five digital items, i.e. 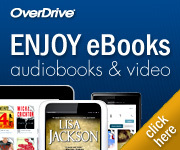 ebooks, downloadable audiobooks and occasionally streaming videos, and five print book titles for your reading, listening and viewing pleasure! And without further ado, here are our ten suggested titles for this week! The heart-pounding follow-up to the “electrifying”* Poison Artist shows what happens when our deepest secrets are unburied. Gavin Cain, an SFPD homicide inspector, is in the middle of an exhumation when his phone rings. San Francisco’s mayor is being blackmailed and has ordered Cain back to the city; a helicopter is on its way. The casket, and Cain’s cold-case investigation, must wait. At City Hall, the mayor shows Cain four photographs he’s received: the first, an unforgettable blonde; the second, pills and handcuffs on a nightstand; the third, the woman drinking from a flask; and last, the woman naked, unconscious, and shackled to a bed. The accompanying letter is straightforward: worse revelations are on the way unless the mayor takes his own life first. An intricately plotted, deeply affecting thriller that keeps readers guessing until the final pages, The Dark Room tracks Cain as he hunts for the blackmailer, pitching him into the web of destruction and devotion the mayor casts in his shadow. In the tradition of John le Carré, the bestselling, impossible-to-put-down, espionage thriller that is “a primer in twenty-first century spying” (The New York Times Book Review), written with the insider detail that only a veteran CIA operative could know—and shortlisted for an Edgar Award. State intelligence officer Dominika Egorova struggles to survive in the cast-iron bureaucracy of post-Soviet intelligence. Drafted against her will to become a “Sparrow,” a trained seductress in the service, Dominika is assigned to operate against Nathaniel Nash, a first-tour CIA officer who handles the CIA’s most sensitive penetration of Russian intelligence. The two young intelligence officers, trained in their respective spy schools, collide in a charged atmosphere of tradecraft, deception, and, inevitably, a forbidden spiral of carnal attraction that threatens their careers and the security of America’s most valuable mole in Moscow. Seeking revenge against her soulless masters, Dominika begins a fateful double life, recruited by the CIA to ferret out a high-level traitor in Washington; hunt down a Russian illegal buried deep in the US military and, against all odds, to return to Moscow as the new-generation penetration of Putin’s intelligence service. Dominika and Nathaniel’s impossible love affair and twisted spy game come to a deadly conclusion in the shocking climax of this electrifying, up-to-the minute spy thriller. Her bloody finger left a translucent smear on the phone screen as she glanced through the list of private investigators in Vegas. Her stained nail came to rest on Sin City Investigations. Jim Bean would serve her well. Private investigator Jim Bean is a straightforward, to-the-point man. He likes his cases to follow suit. But when his latest client, Sophie Evers, asks him to find her brother Daniel, Jim has no idea how complicated his life is about to become. As he falls deep into a manipulative game of cat and mouse, Jim uncovers the horrible truth about Sophie. Now he must set things right before her plan leads to the loss of innocent souls . . . even more than it already has. There’s a killer, and he wears a crooked hat. Private investigator Jack Pellum has spent two years searching for the man who he believes murdered his wife–a man he last saw wearing a peacoat and a fedora. Months of posting fliers and combing through crime records yield no leads. Then a local writer commits suicide, and he leaves a bewildering message that may be the first breadcrumb in a winding trail of unsolved murders . . .
Michael Underhill is a philosophical man preoccupied by what-ifs and could-have-beens, but his life is finally coming together. He has a sweet and beautiful girlfriend, and together they’re building their future home. Nothing will go wrong, not if Underhill has anything to say about it. The problem is, Underhill has a dark and secret past, and it’s coming back to haunt him. These two men are inexorably drawn together in a mystery where there is far more than meets the eye, and nothing can be taken for granted. Filled with devious reversals and razor-sharp tension, The Man in the Crooked Hat is a masterwork from “one of America’s best new crime writers” (Lansing State Journal).